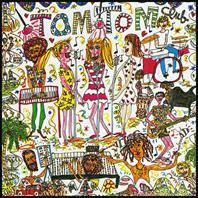 With a more playful take on music than Talking Heads (yes, you read that right - more playful than the Heads), the side project Tom Tom Club by half the band delivers an album that's seriously fun business. So there's nothing like Psycho Killer here, but on the other hand there's not a lot of that on the Heads' albums either. Here we're treated to the likes of Wordy Rappinghood and Genius Of Love, a pair of songs that opens the album, were hot on the charts, and are damn good tracks to boot! Wordy Rappinghood is, while I wouldn't call it rap per se, rhythmically spoken lines over an electro beat. Parts of the song makes me think I can trace a direct musical path from this track to Chicks On Speed [fact check: and after investigating I can see that they've recorded a cover of it about a decade ago, so, well, I guess I was right then]. A whole bunch of names are dropped in Genius Of Love (the video of which I truly hated back inna day) and it's got one of hip hop's staple samples (along with other tracks here), used by everyone from Grandmaster Flash to Ice Cube and Public Enemy. The B-side of the album isn't as extrovert as the A-side, but those more mellow tracks are still full of tiny wonders.